Jorge Lopez looks for another win in his second major league start. The Chicago Cubs have put themselves in position to perhaps conclude a special regular season with another memorable accomplishment. Still in the hunt to host next week’s NL wild-card game, the visiting Cubs try to close out the season with an eight-game win streak Sunday against the Milwaukee Brewers. Kyle Hendricks allowed one hit and struck out eight in six innings and Addison Russell delivered a RBI single in the second that was the difference in Saturday’s 1-0 victory. Winners in 14 of the last 18, the Cubs (96-65) are one game behind Pittsburgh in the race for the top wild-card spot. "It’s pretty interesting isn’t it? I’m really proud of our guys," manager Joe Maddon said. With a victory Sunday and a Pirates’ loss to Cincinnati, Chicago would host Wednesday’s wild-card contest by virtue of owning the head-to-head tiebreaker between the clubs. "It’d be huge," Hendricks said about the possibility of playing at Wrigley Field. "We feel confident in our team no matter where we play, but obviously the home atmosphere has been unbelievable . . . and would help use out that much more." Chicago’s starting pitchers have dominated over the last seven games, yielding one earned run, striking out 53 and walking two over 45 1/3 innings. Dan Haren (10-9, 3.67 ERA) allowed three hits and struck out six without a walk in 7 1/3 innings of Tuesday’s 4-1 victory at Cincinnati to finish 2-0 with a 2.36 ERA in five September starts. "That’s really the best he’s thrown the ball for us," Maddon said about Haren, who is 3-2 with a 4.30 ERA in 10 starts since coming over from Miami in late July. If Chicago is to top Pittsburgh and face St. Louis in the division series, it’s uncertain if Haren would make that roster. However, the veteran right-hander can at least take comfort with the way he’s thrown the ball of late. "The last few times out have been a lot better," he said. "I’m confident I can get the job done." Haren wasn’t overly effective Aug. 11 when he allowed three runs and five hits in 5 1/3 innings of a 6-3 win over Milwaukee. The Brewers (68-93) have totaled two runs and 13 hits while losing their last three games. They’ve scored 25 runs, hit .180 and been fanned 118 times while losing 11 of their last 12 to the Cubs. A possible candidate for the Brewers third base job in 2016, Hernan Perez had one of his team’s two hits Saturday and is 6 for 14 in the last four games. 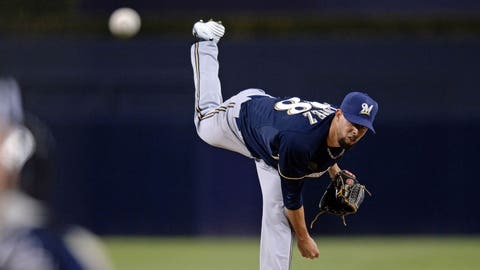 Jorge Lopez (1-0, 5.40) takes the ball for Milwaukee after he allowed three runs, eight hits and struck out seven in five innings to win his major league debut, 4-3 at San Diego on Tuesday. "It was amazing," the right-hander said. "I was excited at first. I was like, ‘Here I am.’ I was thinking, ‘Let’s go and pound and attack the zone.’"
Lopez was the Brewers’ minor league pitcher of the year, and earned the same honor in the Southern League after going 12-5 with 2.26 ERA in 24 starts for Double-A Biloxi. "I like to win games, compete," he said.